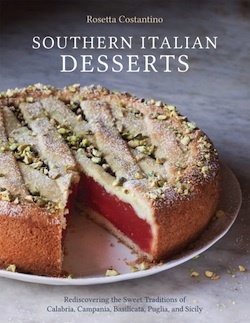 Southern Italian Desserts: Rediscovering the Sweet Traditions of Calabria, Campania, Basilicata, Puglia, and Sicily by Rosetta Costantino with Jennie Schacht is, quite simply, a delicious book that belongs on the shelf of any Italophile and/or foodie. Rosetta is a native of Calabria, and you can’t do better than learning how to make southern Italian desserts from the recipes she has compiled, many of which are downright impossible to find recorded, especially in English. Recipes include traditional, well-known favorites like cannoli and cassata as well as the more obscure Zeppole di San Giuseppe and a watermelon pudding from Palermo — you know you want to try that! Interspersed with the recipes are history lessons, fascinating factoids, and Rosetta’s own personal experiences, all written in a conversational, pleasant style. Sara Remington’s photos, both of the finished desserts and of southern Italian scenes, are gorgeous and will make you alternately hungry and itchy for a trip to the Bel Paese. I highly recommend this book to anyone interested in Italian cooking/baking, southern Italian sweets, or armchair traveling via food. ** NOTE: I received a review copy of this book from NetGalley; the opinions expressed are my own. The link in the post above is an affiliate link, which means if you click on the link and purchase the item, I will receive an affiliate commission.